For all us water sports enthusiasts and for all people who enjoy spending a lot of time at the beach, aloe vera gel is a gift from above. Not only it is the best natural product to treat sun exposed skin, but it will even prevent peeling if sunburn already happened. 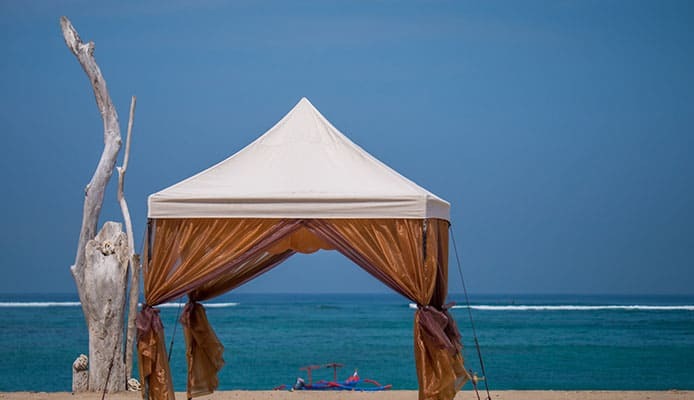 Furthermore, you can use it to prevent sunburn as well, if you apply it in the evening, after taking off your solar protection remnants with a shower. If you’re a fan of anti-ageing skincare products, then you are probably already aware of the added value of aloe vera gel as an intensive skin treatment. Applied constantly, it will help minimize cell damage and promote a more youthful appearance. Last, but not least, if you tend to spend a lot of time in diving suits or water sports jackets, then your skin is probably sore sometimes. The good news is that the best aloe vera gel will also take care of that and bring more comfort to the regular use of wetsuits. But, with so many options on the market, it’s hard to know which product to choose. This is where we come in: after reading this guide, you will know exactly what to look for. A huge bottle of the best aloe vera gel from an organic source, what could a beach goer ask for more? This 100% organic pressed aloe vera gel can be used as a soothing gel to relieve sunburn, razor burn, any skin rashes or bouts of eczema and so on. It’s also a great moisturizer for your body, face, nails and cuticles, and even for your hair. It’s safe to use for babies or pets as well, as it contains zero artificial additives and irritants. There is no added color, no alcohol (which can sometimes irritate sensitive skin), and no added fragrance. Just the goodness of the best aloe vera gel in natural form. Using this top-rated aloe vera gel is a piece of cake, too. It gets absorbed into the skin easily, leaves no sticky residue, no streaks, no color effects, and no traces on your clothes. You can even use it as a makeup base or as a moisturizer right before your tanning lotion. Sometimes, even lotions and products rightfully labeled as completely natural contain xanthan gum, a compound similar to latex or rubber, which can cause irritations. Since xanthan is natural, there’s nothing that these products are doing wrong per se, but it still doesn’t make them ideal to use, especially if you have sensitive skin. This is what we love most about this particular product, and why our editor chose it as the best aloe vera gel of the year. There’s no xanthan gum added, in addition to the formula not containing any artificial additives, either. This high-quality aloe vera gel is made from real freshly pressed juice, unlike many other products which are made from powder. Because of this, the product can be more potent (in a good way), but it can also cause a mild skin reaction until your skin gets used to it. To make sure you won’t get any irritation, you should do a patch skin test a day before you start using it all over. This top-rated aloe vera gel does its job well, but also comes at a very affordable price per quantity. If you’re looking for a budget option for an aloe vera gel for face use, this is it. It’s good enough to be used on your face, it’s great as an after-sun product, but it won’t break the piggy bank, either. You probably heard of the new world wonder in skincare innovation, which is anything South Korean, right? Well, this pure aloe vera gel for sunburn is a great example of top notch South Korean quality. It calms down sun reddened skin almost instantly, moisturized deeply and prevents future sunburn. If you’re looking for a good aloe vera gel without alcohol and that doesn’t cost you a small fortune, this is it. This is the best aloe vera gel if your skin is really sensitive and tends to develop rashes and eczema patches in the summer. Especially if you practice watersports, the combination of water, sun and equipment rubbing against your skin can make the warm season be a difficult time. But with the help of a high-quality aloe vera gel, this won’t be the case anymore. The particular aloe vera harvest that the formula is based on is a special one. It’s particularly rich in vitamins, minerals and protein, which help fortify the skin and make it more capable of defending itself from irritating agents and aggressors. After applying this pure aloe vera gel for sunburn, you will feel instant relief. Your skin will also look noticeably better, and your overall comfort level will improve. The gel is silky smooth and easy to apply. The formula is naturally anti-bacterial and anti-fungal, and will help with skin problems such as acne, too. Another great choice for people with sensitive skin, this product is the best aloe vera gel for a wide variety of problems. If you’re rafting in a mountain area which is also full of mosquitos, you will be pleased to know that the formula has great reviews as a bug bite soothing salve. If you prefer the beach and tanning, there’s good news for you too: it’s the top-rated aloe vera gel for sunburns. Its uses include even scalp itches and psoriasis, or nasty cases of dandruff which you suspect might have a fungus infection as a cause. As any aloe gel without alcohol, it can be also be used for pets, if they have skin rashes or irritations. It moisturizes intensely, but it also improves the condition of oily skin, prone to acne bursts. Another good option for aloe vera gel without alcohol, this jumbo size bottle boasts of being based on 100% purity natural succulent juice. 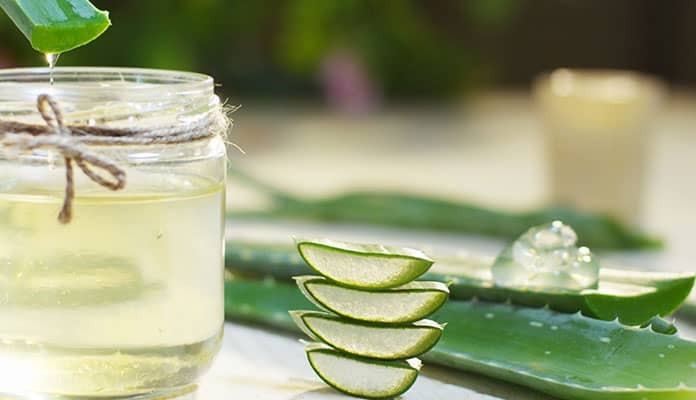 According to most aloe vera gel reviews, it does its job well against minor skin burns (including sunburn) and mosquito bites. Still, the ingredient list reveals that it does in fact contain some additives and some of them aren’t really famous for being kind to your skin or your health. The 100% purity claim in the product’s sales copy probably refers to the origin of the aloe vera juice ingredient, but not to the entire ingredient list. This also explains the very low price for such a large quantity of product. If you’re looking for a cheap aloe vera juice to take the edge off after a demanding day at the beach, the product works well enough. But if your skin is sensitive, it’s probably not as effective as the other formulas in our list of the best aloe vera gels. You may be familiar with the Kate Blanc brand of cosmetics already, and it’s indeed a fairly well-known and reputable source of clean products. Just like the brand promises, their formulas contain no added artificial substances and this aloe vera gel without alcohol is no exception. The gel is based on the cold press extraction of the pure succulent juice, and it is guaranteed to be authentic. This top-rated aloe vera gel is high-quality enough for any sensitive skin, including the one on your face, even if you’re dealing with a rash or a burn. After applying it, you will feel an instant cooling, any itchiness or burning sensation will be soothed, and the redness will immediately subside. It’s a dream come true for everyone who deals with nasty skin problems brought on by the harsh summer elements. A mild aloe vera gel for face, body and hair use, suitable to be used daily as a moisturizer and a safeguard against the irritations that come with summer. This Green Leaf Naturals formula makes a great moisturizing base, and you can apply makeup, sun protection or a tanning lotion on top. According to the manufacturer, the purity of this organic aloe vera gel is so high, that you can even use it as a base ingredient for other DIY cosmetic products (creams, sheet masks, pamper gloves, etc.). But even if you’re not inclined to tweak the formula, just using it as it is will prove to be of great help against sun burns, bug bites and skin rashes. Even though it’s a natural aloe vera gel with no alcohol, the texture isn’t the thick mess that you may be accustomed to. Instead, it’s easy to spread, spreads evenly and gets absorbed into the skin very quickly. Makes a great aftershave lotion for both men and women, and the delicate formula makes it also suitable for kids and pets. 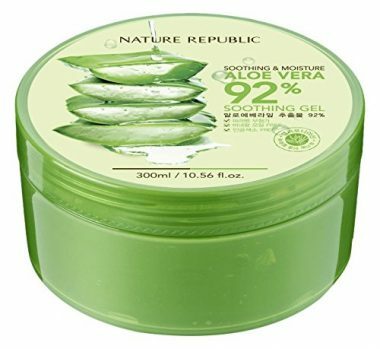 A 99% purity aloe vera gel that moisturizes quickly and efficiently. This product can be used as a soothing salve before and after skin exposure, or simply as an added boost to the skin’s moisture in the hot season. 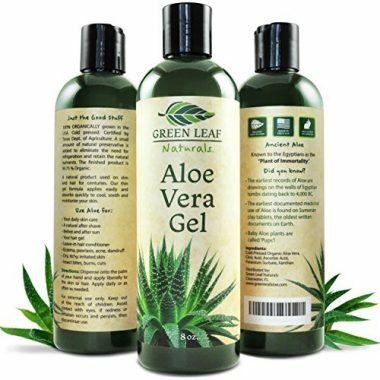 The large size of the jelly bottle makes this among the best aloe vera gel options for family use. The formula provides instant relief and a cooling sensation to sun-ravaged skin. It’s a good choice for families who like carrying as little products as possible and prefer multi-use formulas. This aloe vera gel without alcohol can be used for the face, the body and the hair, and will make summertime more comfortable. An organic aloe vera gel made in the U.S., from aloe vera plants grown and processed on American territory. If you tend not to trust products which get manufactured elsewhere, this is the best aloe vera gel for you. It’s almost as good as homegrown, and it is also certified as organic, vegan and not tested on animals. The formula contains no additives, no alcohol and will suit even the most sensitive complexions. The gel spreads easily and fights mild infections and irritations naturally. This will make minor cuts, burns, razor rashes and sunburns heal faster, and will also make your skin less prone to blemishes. You can also use the gel as a conditioner for your hair, as a face mask or a hand and cuticle cream. Made in the U.S. from organic aloe vera grown in the U.S.
Too many options and still not sure which is the best aloe vera gel for you? Here is what you need to look at before you decide on one or another. The main factors you should consider before deciding on one aloe vera gel or another are the ingredients, the ease of use, and the price. 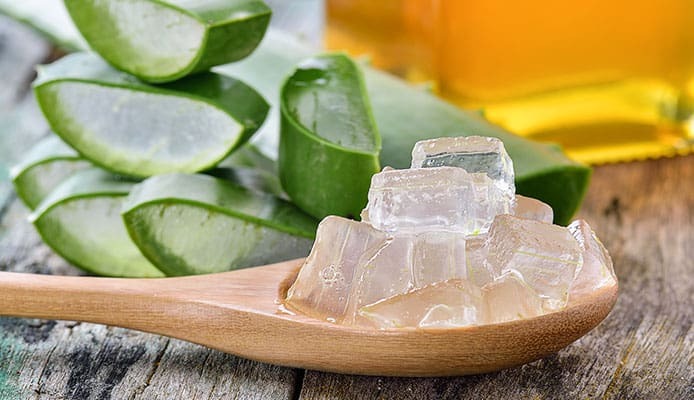 Ingredients: since aloe vera is usually sought after as a moisturizer and treatment for irritated or sunburnt skin, you should make sure that there isn’t anything in it that can damage your skin if it’s already fragile or wounded. Avoid alcohol, fragrance and any other ingredients besides the pure aloe vera gel and maybe 1-2 natural oils. Ease of use: ideally, you’re looking for something that you can spread on your skin easily and that gets absorbed fast. Natural aloe vera gel can be a bit lumpy and will leave a sticky residue on your skin unless you’re very patient in applying it. Therefore, the best aloe vera gel to buy should mention that it’s easy to use and that it will get absorbed into the skin easily. But, at the same time, this convenience shouldn’t come at the expense of ingredients, so make sure you monitor the ingredient list as well. 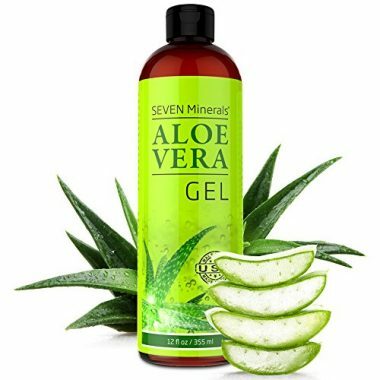 Price: aloe vera gel is a relatively inexpensive product, especially considering that it’s an almost medical-grade ointment and such an effective moisturizer. However, you should realize that the cheaper products probably come with some strings attached (as does anything else you can buy). So to stay on the safe side and to be sure you’re getting the best aloe vera gel for your skin, it’s better to avoid a really cheap product and go for a middle and upper priced one. Aloe vera is considered a wonder of nature and a natural beauty remedy, it’s been in use for centuries and as soon as you try it out for yourself, you understand why. It’s like nature consciously struggled to create the perfect skincare cream and anti-rash ointment and succeeded in combining them in this succulent juice. The perfect balance of water and enzymes in organic aloe vera gel can drive moisture deep into the skin, replenishing its levels of hydration. 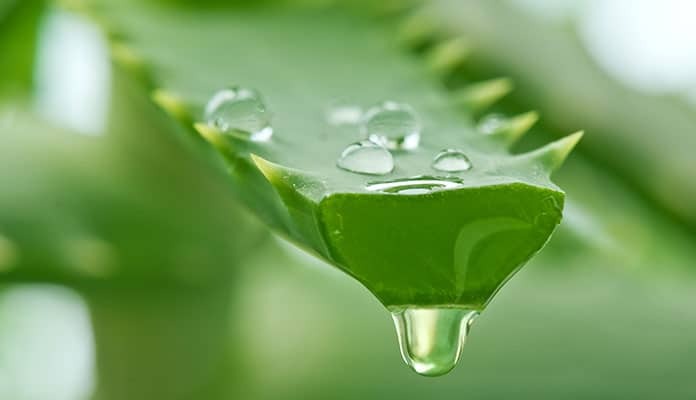 Also, because of the plant’s natural anti-bacterial and anti-fungal substances, the skin enjoys a similar level of protection when applying aloe vera gel. Simply put, any small wound (like burns, rashes or minor cuts and bug bites) will heal faster in the anti-septic environment that the layer of gel creates. Not only bacteria, but also fungi particles will be removed by the action of the aloe vera gel. Since some skin rashes and eczema patches have a fungal cause, this double effect will help heal them away even faster. Besides the hydrating action and the healing effect, natural aloe vera gel also nourishes the skin with important enzymes, proteins, vitamins and minerals. This helps the skin become fortified and more capable of protecting itself from the free radicals that bring about ageing. 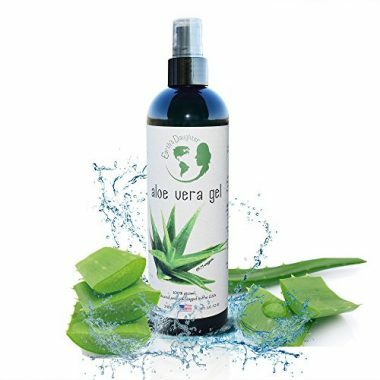 As you could see from the product descriptions above, most of the aloe vera gels on the market boast that you can use them on your hair and nails as well. But what are the main ways to use aloe vera on your skin, and how should you do it? This is everything you need to know. As a moisturizer: Apply a small quantity of aloe vera gel after washing your skin and patting it dry. Wait 1-2 minutes until it gets completely absorbed in your skin, then follow up with a bit of cream (optionally). Then you can apply makeup or sun protection lotion as usual. If you’re using it in the evening, you can go directly to bed, and let the aloe work its magic overnight. As a face mask: Apply a generous quantity of aloe vera gel on clean, freshly washed skin. Let it dry on your face for about 20-30 minutes. For a more moisturizing effect, you can spray some fresh water (or thermal water) on top of it every now and then, to prevent it from drying. This way, the aloe mask will just carry the water you add deep into your skin, nourishing it. After 30 minutes or so, gently rinse with tepid water, or wipe off with a wet towel. Continue with your usual moisturizer. As a moisturizer: Simply apply generous amounts of aloe vera gel on your clean skin, just as you would do with your favorite body butter / body souffle cream. Wait a few minutes until the gel gets absorbed into the skin. If you’re using a top-quality aloe vera gel such as the ones presented above, you should be able to get dressed right away. If you’re preparing to go to the beach, don’t forget to also apply a sun protection lotion after the aloe vera. As a treatment for sunburn or rashes: Gently wash and prepare the skin, patting it dry with a soft clean towel. Then, apply a generous amount of aloe vera gel on affected areas (at least half an inch thick). Leave it on for as long as possible (around 1 hour). Gently wash it off with tepid water and allow the affected area to dry off. Q: Where does Aloe Vera Come from? A: Aloe vera is a succulent that thrives amid arid conditions. Its capacity to retain water and store it is actually what makes it such a great moisturizer. It is believed that the aloe vera plant originated in Sudan, but it grows in a wide area around the Equator, covering parts of India, Africa and South America. Q: What Ingredients Do You Usually See in Aloe Vera? 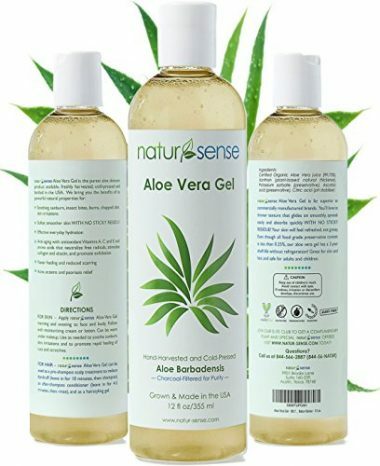 A: Besides aloe barbadensis, which is the actual plant ingredient, you will be able to see some other ingredients mentioned on the label of any aloe vera gel on the market. Some of these ingredients are safe, some are less so. The harmless ingredients you can see in aloe vera gel: citric acid and ascorbic acids (relatively harmless preservatives), water, ascorbic acid (a form of vitamin C), sunflower oil or grapeseed oil (extra emolliating ingredients), xanthan gum (sometimes debated as an ingredient, it’s a natural compound that helps the gel spread easier on the skin). The potentially irritating ingredients: triethanolamine, iodopropynyl butylcarbamate, any chemical name that ends in EDTA or MEA (like cocamide MEA or sodium EDTA), and fragrance. The only thing that can put a damper on how fun summer can be is the assortment of skin problems which can accompany life outdoors. Wind and sun rashes, bug bites, jellyfish stings, minor cuts and burns, you name it. Luckily, the best aloe vera gels on the market will make you forget all about these minor inconveniences. We hope our guide helped you figure out how to use aloe vera and what the best option for you is. Have fun and enjoy your summer! How to Check If You’re Buying Good Quality and Beneficial Aloe Vera Gel, Aloe Bee Health. Aloe Vera Gel Research Review, Natural Medicine Journal. 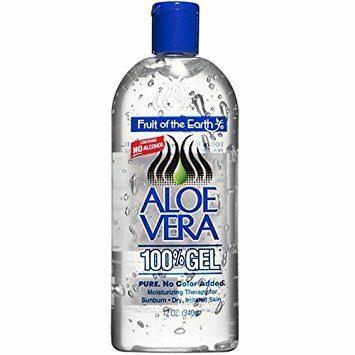 Do you usually use aloe vera gel after sun exposure or to soothe skin rashes you might have after wearing a water sports suit for a long time? What are your experiences with this type of product? What’s the best aloe vera gel you ever used? Share your thoughts with the Globo Surf community below and help us all learn from each other.